I.D. 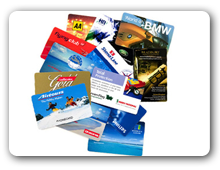 Tech Solutions manufactures and supplies ultra high quality pre-printed cards in Delhi. Pre-Printed cards are used extensively today. Printed on full spectrum of colors on Heidelberg Printing machines, our cards provide the most beautiful and accurate reproduction of the artwork with a mirror like finish and a scratch resistant surface. The pre-printed cards manufactured by us are highly durable and long- lasting and are both pleasing to the eye as well as highly practical. We manufacture and deliver these pre-printed cards for clients across all industries and across the length and breadth of India. Full color plastic cards are four color litho printed with Heidelberg machines. Unlike inkjet printers, thermal printers or color photocopiers, full color (C-M-Y-K) printing provides accurate, precise, detailed, natural, brilliant reproduction of your originals at a low cost-per-sheet. Our full color plastic card printing service has same process and quality as credit cards production, exactly like the credit cards. Types: Loyalty Cards, Membership Cards, Discount Cards, VIP cards, Gift Cards and more.